There are some really nice models and gashapon here. I'm going to add some photos I took at a friends house. He's got a huge collection. Really huge! Consider this to be a taste of what a real collector's collection can look like. Note that these are all gashapon. He's got some nice models also, but I didn't bother posting photos of them since he mostly collects the little figures. Now that's a real collection!! Quiver in fear of his gashapon army. OMG... That's some collection your friend has, NSW. I'm especially envious of his Tsukihime collection; I want a figure of Arcurid wearing the gown. I have the Ciel figure, though, but mine is transparent. Did he paint it? Nope. Gashapon usually come in colors though some assembly is required. This is the sort of little figures that was traditionally sold in little plastic balls they got randomly out of vending machines. 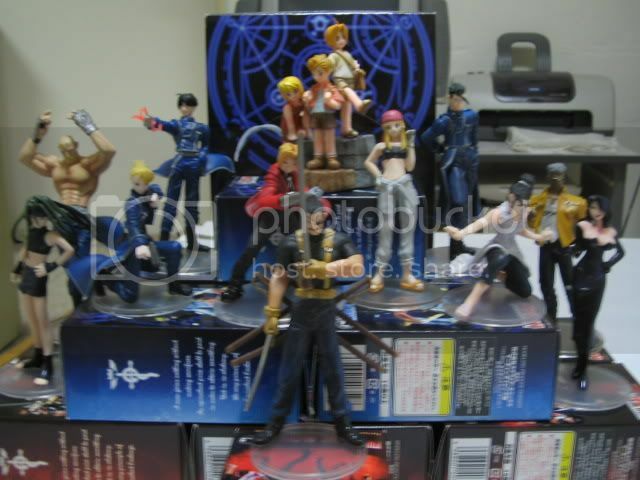 Though the Tsukihime set did have a number of crystal figures so that you could paint them yourself. I guess you got the crystal Ciel if yours is transparent. Wow, this is Otaku-class of collection...I'm not worthy! now with 20% more ego! Wow. Now that is a huge collection! How much money did he spend on those? Oh my gosh. 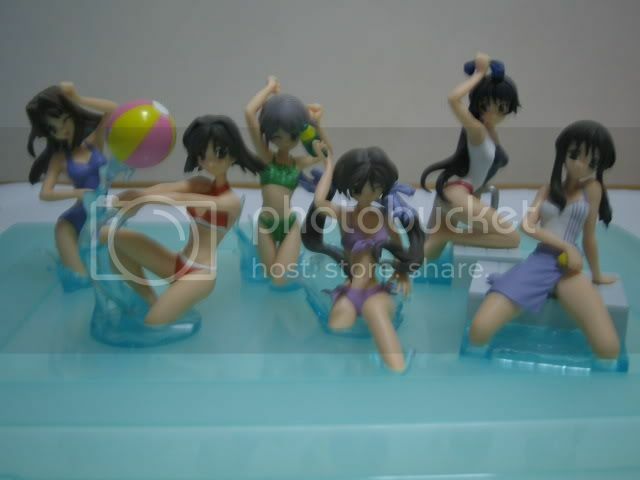 He also has some of the Ikkitousen figurines, I'm still looking for them. Gashapon are really quite cheap at $2 a figure.It's only expensive if you are aiming for a complete collection of a set of figs at which you tend to get lots of extras.Now there are places you can get a complete set of figs at $20-$30 a set. In both case, it's good if you can find a community in which to trade extras. Here's something cute as an example of trading figures. Yep yep thats true. Gashapon figures are pretty cheap, and are fairly easy to build a collection out of. Next are trading figures, than regular figures, than vinyl statues, than pvc statues, and finally resin statues. Heres an estimate on the pricing range. KEEP IN MIND IT COULD VARY DEPENDING ON THE ITEM TYPE AND RARITY OF THE TIME YOUR GETTING. That gashapon collection is pretty big though, must at least cost $150 bucks if not more! Im trying to collect mostly resin statues right now, but I only have 3 statues and I already spent about $187 dollars on my collection. Not much of a collection yet. Yup, the same. Bandai lowered the price down to 200 yen. Good decision too. Those figs are OK for 200 yen fig but nothing special.There's better stuffs out there. Either the "Mai-HiME" gashpons were really popular or just the opposite because none of the machines that were there a month ago in Akihabara was there today. What is the half-life of these things anyway? I did, however, complete my collection of this series and picked up the Mai and Natsuki figures. Yes, I cheated by going to a store, but it's either that or go to every anime-related place to look for a gashapon machine. Whoever thought the bracelets and anklets would be cool for Mai needs to be punished by having to attach them to her gashpon. Those things took a really long time to put on, and I still don't dare touch the thing afterwards! AFAIK, these things tend to have pretty limited production runs and some of them disappear quick. Half the fun to collectors is to feed money to the machine, in anticipation of what might come out next. Like I said if you can find people to trade extras with, it's cheaper then getting them in one complete set from a store. If you watched the anime, those wheels are ugly compared compared to their animated counter parts. Here's a better upcoming version of Mai-Hime figs by CMS. Bandai can never really make any above average figs of anime girls.The only figs they are good with is of Mechas. Heh, I just bought my first figurines today with the Fullmetal Alchemist Trading Arts Vol. 2. I only wanted King Bradley and picked 3 to test my luck. What happened is that I ended up with what I wanted, the 'Special' of the set and the best detailed figurine of the lot. Now what kind of first time buyer's luck is that? FMA's Wrath aka King Bradley! Ed, Al and Winry in their childhood. EDIT: And that Bradley one is awesome, IMO. He said he bought those 3 figs in a box.AFAIK, CC always sell those kind of figs as a set, not in their original "tikam" (random) format. Here's the entire FMA Trading Arts series in all their glory. Oops.Forgot to pul Al in there. 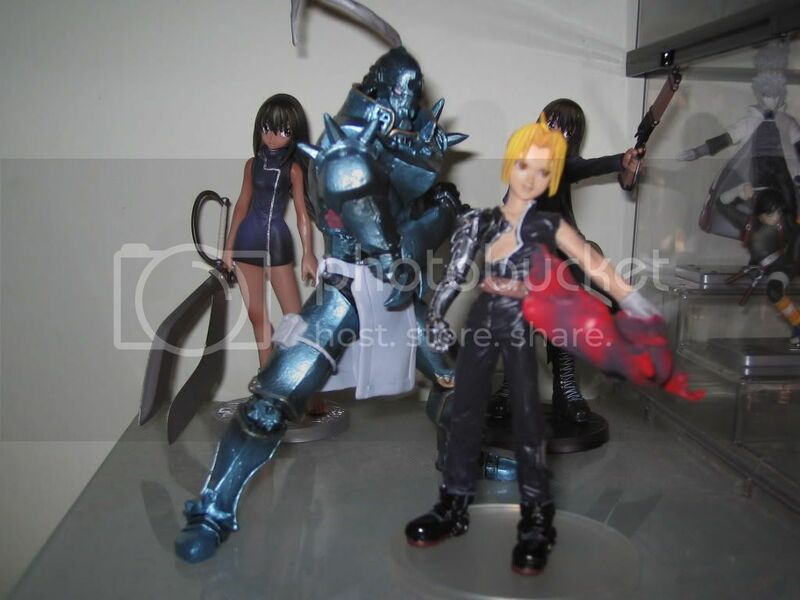 MakubeX2 is indeed missing the metallic looking Alphonse from his FMA Trading Arts Vol 1 & 2.
by the way anybody know whether any online store selling hajime no ippo figurines ? I really love that one! Whereas I have the original version of the Rei figure, which looks much better than the repaint version imo. Paid 16€ for each iirc. I just have them in my favorite pose all the time: Asuka with her hand on her hips, and Rei holding the Lance. Then I have two Resin figures of Asuka, one in her plugsuit sitting on her side, and another with her in underwear pulling her shirt over her head, and one of Rei standing in her plugsuit. Finally, I also have a very nice one of Galaxy Fräulein Yuna which I could get real cheap.